Grant, O merciful God, that we may experience at all times the fruit produced by the paschal observances. Through our Lord Jesus Christ, your Son, who lives and reigns with you in the unity of the Holy Spirit, one God, for ever and ever. According to the Tridentine Calendar, today is the feast of St. Stanislaus, the patron of Poland. He reproached King Boleslaus the Cruel for his dissolute life, and while saying Mass, was put to death by him in 1079. In Poland his feast is celebrated on May 8, which is the day he died. His feast in the Ordinary Form of the Roman Rite is celebrated on April 11. Rosa Venerini was born in Viterbo, on February 9, 1656. Her father, Goffredo, originally from Castelleone di Suasa (Ancona), after having completed his doctorate in medicine at Rome, moved to Viterbo where he practiced the medical profession brilliantly in the Grand Hospital. From his marriage to Marzia Zampichetti, of an ancient family of Viterbo, four children were born: Domenico, Maria Maddalena, Rosa and Orazio. Rosa was naturally gifted with intelligence and an uncommon human sensibility. The education that she received in her family allowed her to develop her many talents of mind and heart, forming her in steadfast Christian principles. According to her first biographer, Father Girolamo Andreucci, S.I., she made a vow to consecrate her life to God at the age of seven. During the early years of her youth, she lived through a conflict between the attractions of the world and the promise made to God. Rosa overcame this crisis with trusting prayer and mortification. At age twenty, Rosa raised questions about her own future. The women of her time could choose only two orientations for their live: marriage or the cloister. Rosa esteemed both, but she felt called to realize another project for the good of the Church and the society of her time. Urged on by prophetic interior occurrences, she committed much time in suffering and searching before reaching a resolution that was completely innovative. In the autumn of 1676, on the advice of her father, Rosa entered the Dominican Monastery of St. Catherine, with the prospect of fulfilling her vow. With her Aunt Anna Cecilia beside her, she learned to listen to God in silence and in meditation. She remained in the monastery for only a few months because the sudden death of her father forced her to return to her suffering mother. In the years immediately following, Rosa had to bear the burden of serious events for her family: her brother Domenico died at only twenty-seven years of age; a few months later her mother died, unable to bear the sorrow. In the meantime, Maria Maddalena married. There remained at home only Orazio and Rosa, by now twenty-four years old. Challenged by the desire to do something great for God, in May of 1684, the Saint began to gather the girls and women of the area in her own home to recite the rosary. The way in which the girls and women prayed, and above all, their conversation before and after the prayer, opened the mind and heart of Rosa to a sad reality: the woman of the common people was a slave of cultural, moral and spiritual poverty. She then understood that the Lord was calling her to a higher mission which she gradually identified in the urgent need to dedicate herself to the instruction and Christian formation of young women, not with sporadic encounters, but with a school understood in the real and true sense of the word. On August 30, 1685, with the approval of the Bishop of Viterbo, Cardinal Urbano Sacchetti and the collaboration of two friends, Gerolama Coluzzelli and Porzia Bacci, Rosa left her father's home to begin her first school, according to an innovative plan that had matured in prayer and her search for the will of God. The first objective of the Foundress was to give the girls of the common people a complete Christian formation and prepare them for life in society. Without great pretense, Rosa opened the first "Public School for Girls in Italy". The origins were humble but the significance was prophetic: the human promotion and spiritual uplifting of woman was a reality that did not take long to receive the recognition of the religious and civil authorities. The initial stages were not easy. The three Maestre (teachers) had to face the resistance of clergy who considered the teaching of the catechism as their private office. But the harshest suspicion came from conformists who were scandalized by the boldness of this woman of the upper middle class of Viterbo who had taken to heart the education of ignorant girls. Rosa faced everything for the love of God and with her characteristic strength, continuing on the path that she had undertaken, by now sure that she was truly following the plan of God. The fruits proved her to be right. The same pastors recognized the moral improvement that the work of education generated among the girls and mothers. The validity of this initiative was acknowledged and its fame went beyond the confines of the Diocese. Cardinal Mark Antonio Barbarigo, Bishop of Montefiascone, understood the genius of the Viterbo project and he called the Saint to his diocese. The Foundress, always ready to sacrifice herself for the glory of God, responded to the invitation. From 1692 to 1694, she opened ten schools in Montefiascone and the villages surrounding Lake Bolsena. The cardinal provided the material means and Rosa made the families aware, trained the teachers, and organized the schools. 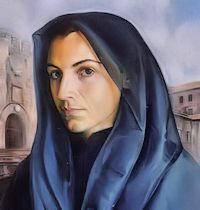 When she had to return to Viterbo to attend to the strengthening of her first school, Rosa entrusted the schools and the teachers to the direction of a young woman, St. Lucia Filippini, in whom she has seen particular gifts of mind, heart and spirit. After the openings in Viterbo and Montefiascone, other schools were started in Lazio. Rosa reached Rome in 1706, but the first experience in Rome was a real failure which marked her deeply and caused her to wait six long years before regaining the trust of the authorities. On December 8, 1713, with the help of Abate Degli Atti, a great friend of the Venerini family, Rosa was able to open one of her schools in the center of Rome at the foot of the Campidoglio. On October 24, 1716, they received a visit from Pope Clement XI, accompanied by eight Cardinals, who wanted to attend the lessons. Amazed and pleased, at the end of the morning he addressed these words to the Foundress: "Signora Rosa, you are doing that which we cannot do. We thank you very much because with these schools you will sanctify Rome". From that moment on, Governors and Cardinals asked for schools for their areas. The duties of the Foundress became intense, consisting of travels and hard work interwoven with joys and sacrifices for the formation of new communities. Wherever a new school sprang up, in a short time a moral improvement could be noted in the youth. Rosa Venerini died a saintly death in the community of St. Mark's in Rome on the evening of May 7, 1728. She had opened more than forty schools. Her remains were entombed in the nearby Church of the Gesù, so loved by her. In 1952, on the occasion of her Beatification, they were transferred to the chapel of the Generalate in Rome. She was canonized by Pope Benedict XVI on October 15, 2006 at Rome. During her entire life, Rosa moved in the ocean of the Will of God. She said, "I feel so nailed to the Will of God that nothing else matters, neither death nor life. I want what He wants; I want to serve Him as much as pleases Him and no more". After her first contacts with the Dominican Fathers at the Sanctuary of Our Lady of the Oak Tree, near Viterbo, she definitely followed the austere and balanced spirituality of St. Ignatius of Loyola under the direction of the Jesuits, especially Father Ignatius Martinelli. The crises of adolescence, the perplexity of youth, the search for a new way, the institution of the schools and the communities, the rapport with the Church and the world-all were oriented to the Divine Will. Prayer was the breath of her day. Rosa did not impose on herself or her Daughters long vocal prayers, but recommended that the life of the Maestre, in the practice of the precious education ministry, be a continuous speaking with God, of God and for God. Intimate communion with the Lord was nourished by mental prayer, which the Saint considered "essential nourishment of the soul". In meditation, Rosa listened to the Teacher who taught along the roads of Palestine and in a particular way from the height of the Cross. With her gaze upon the crucifix, Rosa always felt more strongly her passion for the salvation of souls. For this reason, she celebrated and lived daily the Eucharist in a mystical way. In her imagination, the Saint saw the world as a great circle; she placed herself in the center of it and contemplated Jesus, the immaculate victim, who offered Himself from every part of the world to the Father through the Eucharistic Sacrifice. She called this means of elevating herself to God "The Greatest Circle". With incessant prayer, she participated spiritually in all the Masses being celebrated in every part of the world. She united with love the sufferings, hard work and joys of her own life to the sufferings of Jesus Christ, concerned that His Precious Blood would not be shed in vain. We can summarize the charism of Rosa Venerini in a few words. She lived consumed by two great passions: passion for God and passion for the salvation of souls. When she understood that the girls and women of her time needed to be educated and instructed in the truths of the faith and of morality, she spared nothing of time, hard work, struggle, and difficulties of every kind, as long as it responded to the call of God. She knew that the proclamation of the Good News could be received if people were first liberated from the darkness of ignorance and error. Moreover, she intuited that professional training could give woman a human promotion and affirmation in society. This project required an educating Community and Rosa, without pretense and well before its time in history, offered to the Church the model of the Apostolic Religious Community. Rosa did not practice her educational mission only in the school but took every occasion to announce the love of God. She comforted and cured the sick, raised the spirits of the discouraged, consoled the afflicted, called sinners back to a new life, exhorted to fidelity consecrated souls not observing their call, helped the poor and freed people from every form of moral slavery. "Educate to save" became the motto that urged the Maestre Pie Venerini to continue the Work of the Lord intended by their Foundress and radiate the charism of Rosa to the world: to free from ignorance and evil so that the project of God which every person carries within can be visible. This is the magnificent inheritance that Rosa Venerini left her Daughters. Wherever the Maestre Pie Venerini strive to live and transmit the apostolic concern of their Mother, in Italy as in other lands, they give preference to the poor. After having made its contribution to the Italian immigrants to the USA from 1909 and in Switzerland from 1971 to 1985, the Congregation extended its apostolic activity to other lands: India, Brazil, Cameroon, Romania, Albania, Chile, Venezuela and Nigeria.